Indeed, it was a very surprising, memorable and a happy day. Thanks to my very thoughtful and sweet husband who send me some flowers and cake on this special day. 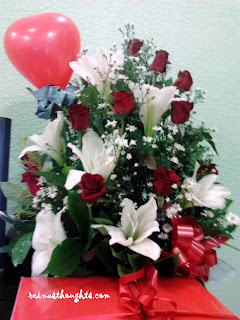 Though he is away from me on this special day, he did not neglect to make it special. With the help of his cousin and nephew, he was able to send me those flowers and the cake. I never thought that he would do that. Being in this relationship for almost eight years already from lovers to married couple, he never did this before. It is the first time that he gave some flowers. I highly appreciated the effort and the sweetness he had shown. Hope he will stay the same for the rest of our lives. I hope that you also had a great day the same way that I had. Happy Valentines to all!!! 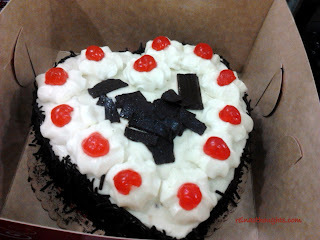 oo ngah.. not expected.. nbsa k rin post po.. sweet nm ni sir ed2..
belated happy valentine's sa inyo, reina!